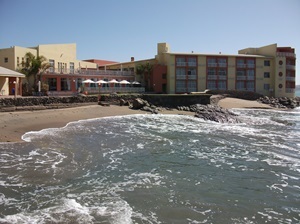 The Nest Hotel is situated directly on Lüderitz bay with its own private beach. A variety of fresh seafood, including the famous Lüderitz oyster and lobster, is served in the Penguin Restaurant. Outstanding and personalized service is a matter of course at this four star Hotel. All 62 twin rooms, 8 double rooms and 3 suites are sea-facing and have air-conditioning, satellite TV, radio and telephone. From the cosy lounge the traveller can experience a breathtaking sunset. Enjoy a sundowner in the well-stocked hotel bar or relax at the indoor solar heated swimming pool and sauna that invite you to relax in comfort and style after a long day's travelling through the desert. All 22 rooms are tastefully furnished with en-suite bathrooms . 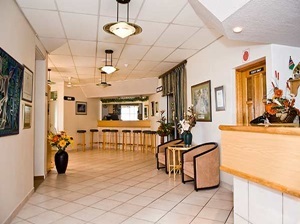 The hotel offers a night porter, 24hrs secured parking, laundry, airport transfers, special occasion catering, email, fax and copy service, safe for valuables. 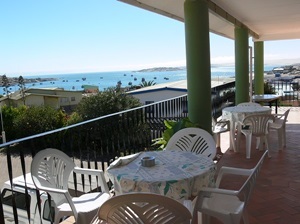 Most of the rooms have their own balcony with a beautiful view over the town, the harbour and bay of Lüderitz. The á-la-carte restaurant is specialized in fresh seafood, including lobster. Experience a new dimension of comfort at Zur Waterkant Guest House, situated in the picturesque harbour town of Lüderitz in Namibia. 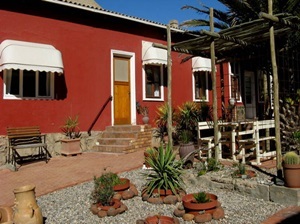 The guest house is situated in a quiet area of the quaint town, and offers accommodation in 4 double rooms as well as 2 rooms (up to 4 beds) equipped for self catering guests.The rooms are tastefully decorated and have a bathroom with shower. All rooms are sea facing, with a balcony offering panoramic views over the sea, bays and harbour of Lüderitz. Embraced by the Namib Desert and sitting on the knee of the Atlantic Ocean is the quaint town of Lüderitz. Haus Sandrose is a proud member of the Bed and Breakfast Association of Namibia and is registered with the Namibia Tourism Board as a self-catering accommodation establishment. Some say the garden is enchanted…. Everyone says time ceases to be of consequence…. No-one can believe one can sleep so soundly in the centre of town…. All we can say is…. Welcome to Haus Sandrose !